Career Conversations is a new initiative to enhance INTI students’ prospects of employment at the point of graduation. It involves a three step approach: students conferring with top employers and industry experts on the expectations of industry; application of aptitude tests and career discovery tools to narrow down students’ areas of interests; and students’ participation in career workshops conducted by industry experts to help determine the right career pathway to pursue. Ultimately, it prepares students for an on-campus graduate recruitment process that involves top employers seeking talent for multinational organisations. 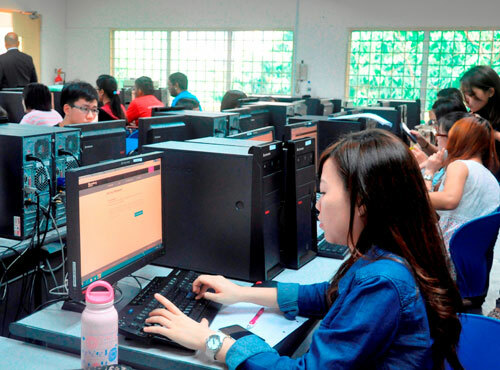 INTI students have the Bloomberg Aptitude Test among other assessment tools to aid individual development. The recently launched initiative made its debut with Tehani Perera, APAC Regional Manager, Bloomberg Institute, who provided insights into the institute, the educational division of Bloomberg LP, and shared why a civil engineer by training chose to venture into the financial sector, a trait seen by many of her peers at Bloomberg who like her hail from diverse backgrounds. Students were also introduced to the Bloomberg Aptitude Test (BAT), a global, standardized online exam covering a range of performance areas including analytical reasoning, global markets, math, economics, news analysis, and other relevant topics. Scores from the test will reveal not only their strengths and weaknesses in eight subject areas but also provide an analysis of their scores against other BAT entrants around the world. Designed for undergraduates and recent graduates who are interested in a full-time or internship position in finance, the BAT is a great asset for students seeking recognition by top employers from around the world, thus bringing students wider opportunities to realise their career aspirations. Strong emphasis is placed on individual development at INTI, along with international exposure and innovative learning. Individual development involves the student’s journey of transformation to become a competent graduate via a self-discovery and development plan using personality assessment tools, industry talks, and career camps. Individual development also involves on campus recruitment which has seen close to 500 students offered jobs by top employers such as IBM and HSBC since 2011. INTI students are also trained to develop soft skills that lead to strong leadership ability, confidence and the ability to analyse and strategise, in addition to being decisive and resourceful. Through industry-run workshops and forums that include employer career coaching sessions as well as interview, resume and grooming skills workshops students are guided towards a rewarding and fulfilling career. For more information on Career Conversations and other initiatives to enhance student employability at INTI, call 06-798 2000 / 03-5623 2800 / 03-2052 2888 / 04-631 0138.